Arkansas beckons hikers. More than 250 trails cut through the hills and hollows, across the prairies and dark Delta soil, and into the vast hardwood and pine forests. The Ozark Highlands Trail and the Ouachita Trail, both National Recreation Trails, are premier examples of the hiking opportunities in The Natural State. Hikers who take these trails will find vast tracts of unspoiled wilderness, hidden lakes, clear-running streams and rivers, and the clean air of the Ozarks and Ouachita Mountains. The trails change with Arkansas's four distinct seasons, offering variety with every outing. Slipping 178 miles into Arkansas's wilderness, the Ozark Highland Trail loops across the rugged northern reaches. It begins at Lake Fort Smith State Park near Fort Smith, then cuts eastward through the Ozark National Forest, a 1.1-million-acre preserve. The trail then roams north up to the Gene Rush/Buffalo River Wildlife Management Area. It travels along the pristine Buffalo River, the country's first national river, to join the Buffalo River Trail. This trail continues down river about 13 miles to Tyler Bend Campground. White rectangular paint blazes mark the way. Blue rectangular paint blazes mark spur and side trails. Those who hike the trail or any portion of it will find unspoiled countryside that looks much the same as it did to pioneer settlers. They may encounter thick forests of oak, hickory and other hardwoods, high bluffs, unusual rock outcroppings, and plenty of mountainous terrain. All along the way are Ozark streams and rivers. The trail is divided into three sections. The Western Section begins at the Lake Fort Smith State Park trailhead, continuing on to the Lick Branch trailhead near the Little Mulberry River. The Middle Section runs from Lick Branch to the Big Piney trailhead on the Big Piney River close to Haw Creek Falls Campground. Starting at the Pig Piney, the Eastern Section meanders through the Ozarks to the Buffalo National River Boundary near Woolum Campground. Beginning at Pinnacle Mountain State Park, 15 miles west of Little Rock, the Ouachita Trail runs 225 miles through the Ouachita National Forest, a 1.6-million-acre preserve in central and western Arkansas, to Talimena State Park near Talihina, OK. This trail crosses high ridges and valleys, with elevations ranging from 600 to 2,600 feet. It wanders through forests composed of pine as well as hardwoods, including oaks. The Ouachita Mountains follow an east-west path; hardwoods cover the moist northern slopes, while pines forest the southern slopes. Management of the trail is divided. Pinnacle Mountain State Park oversees the first 32 miles. The remaining 193 miles come under the management of the U.S. Forest Service. Blue vertical rectangles mark the main trail. White blazes mark most spur and side trails. Two state parks, Pinnacle and Queen Wilhelmena near Mena, as well as three National Forest Recreation Areas, including Big Brushy, Iron Springs, and Lake Sylvia, provide facilities along the trail. Camping is permitted along both trails anywhere outside of the recreation areas. One exception is the first (the most western) six miles of the Ozark National Trail. Difficulty for both trails ranges from easy to strenuous. Campgrounds usually are rustic, as are restroom facilities. At some sites, campers must bring their own water. Rangers ask campers to follow trail etiquette, which encourages camping at least 200 feet away from trails and water sources, and preferably out of sight of the trails. They also encourage campers to use previous campsites if one is available. Three maps of the Ozark Highlands Trail, developed by the U.S. Forest Service, cover the trail. The maps, which indicate topographic contours, campgrounds, streams, trailhead access points and other information, can be ordered from the Ozark Interpretive Association, P.O. Box 1279, Mountain View, AR 72560. Telephone 870-757-2211. The maps are $3 each plus shipping and handling. For maps and brochures covering the trail's first six miles, write the Superintendent, Lake Fort Smith State Park, P.O. Box 4, Mountainburg, AR 72946. Telephone 501-369-2469. They are also available at the park's Visitors Center. A map and trail guides for the first 32 miles of the Ozark Trail can be picked up at the Pinnacle Mountain State Park Visitors Center, or by writing to the Superintendent, Pinnacle Mountain State Park, 11901 Pinnacle Valley Road, Roland, AR 72135. There is a $1 fee for the map. A map of the other 193 miles can be obtained by writing to: Forest Supervisor, Ouachita National Forest, P.O. Box 1270, Federal Building, Hot Springs, AR 71902. Telephone 501-321-5202. The map costs $3. 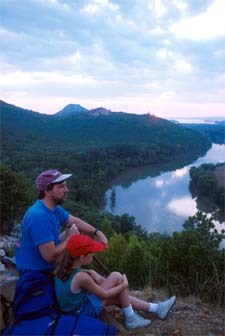 Top-rated guides to both trails have been published by Tim Ernst, an Arkansas author, outdoor photographer, and well-known hiker. Each guide offers mile-by-mile descriptions of the trails, including historical facts, scenic and wilderness areas, and information on campgrounds, shuttle services, and weather. The guides also contain maps, mileage guides, and elevation profiles. The Ozark Highlands Trail Guide, Third Edition and The Ouachita Trail Guide are available for $14.95 each plus $2 for shipping and handling from: Tim Ernst, 411 Patricia Lane, Fayetteville, AR 72703. Telephone 1-800-838-HIKE. The guides also are available at area bookstores and sporting goods stores. In addition to the two National Recreation Trails, Arkansas enjoys more than 250 hiking trails that total more than 1,500 miles. There are backpacking trails, horseback trails, and trails just for walking. So, take a hike! The trails of Arkansas are waiting. An "Arkansas Adventure Guide" can be ordered from the Arkansas Department of Parks and Tourism, One Capitol Mall, Little Rock, AR 72201. Telephone 1-800-NATURAL or visit www.arkansas.com.